Bluewater cruising Italian style at its best. The Grand Soleil Cruise range offers exceptional comfort, space and safety at sea with a finish and craftsmanship that is clearly an extension of the Grand Soleil Performance range. Long cruise sailing is all about your life aboard while going the distance. A clever combination of high interior volumes and an innovative deck layout offers the bluewater sailor an extremely spacious interior while delivering excellent performance and easy handling. Grand Soleil is celebrating 40 years in the boat business and has over 3,800 boats sailing the world. No wonder their sailboats are called “iconic”… they’ve left their mark in the history of modern sailing. The Cruise range is completely dedicated to the adventurer seeking long voyages in the best of comfort. Multifunctional roll-bar across the top of the cockpit for safety. The mainsheet is located on top of bar removing the traveller from the cockpit floor. 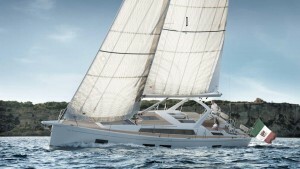 It also supports the Bimini awning and spray hood.